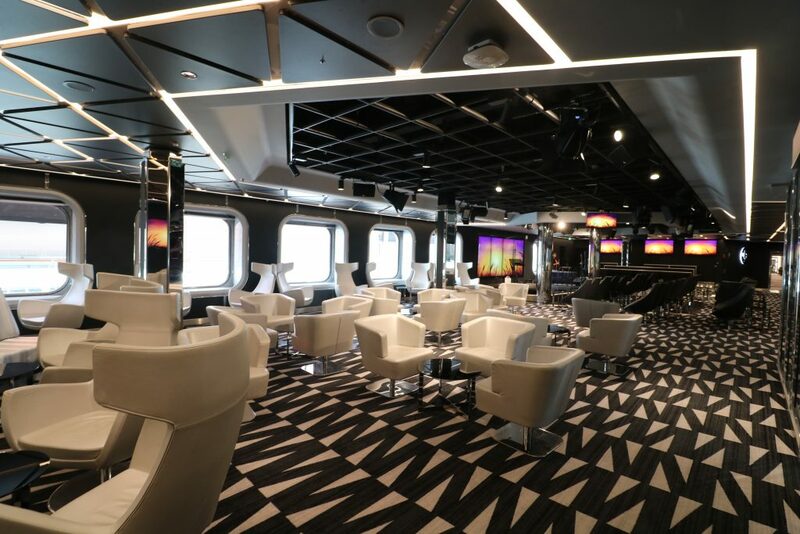 Two Saturdays ago, at the end of August, a group of UK cruise bloggers were invited to review the wonderful MSC Meraviglia while she was visiting Southampton. I was so excited to see this beautiful Italian lady, especially as I had already fallen for two of her older sisters previously. For a cruise ship that entered service in June 2017, Meraviglia looks pristine at 15 months of age. And how amazing to have such a new vessel on our Northern shores? 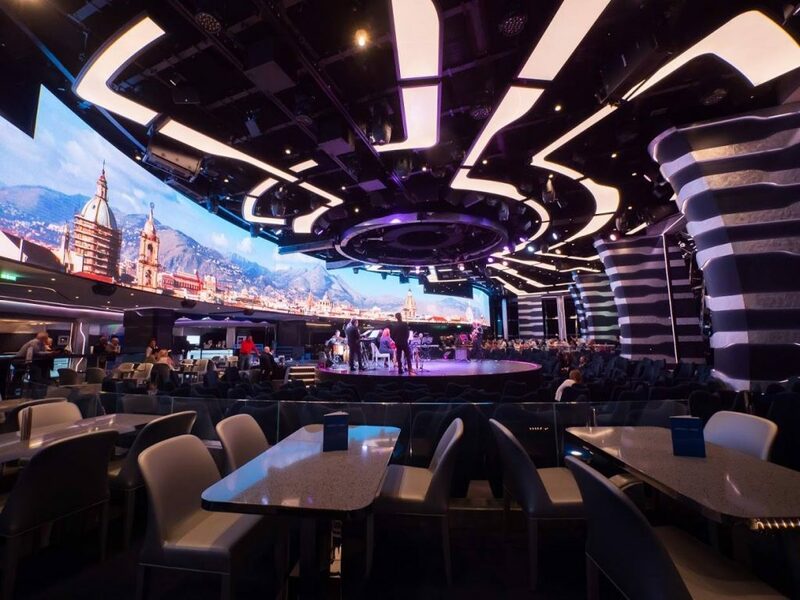 If you are looking for an MSC Meraviglia review, perhaps these photos will help you decide if she is the one for you. I hope to be your matchmaker and set you up… if you haven’t yet been convinced to give MSC a try. 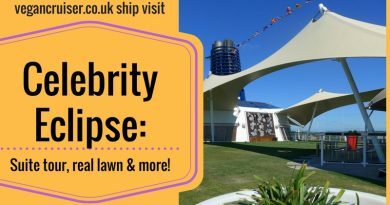 If you’re totally new to cruising, this should tempt you to give cruising a go too! In case you are totally new to MSC, here’s what you need to know. 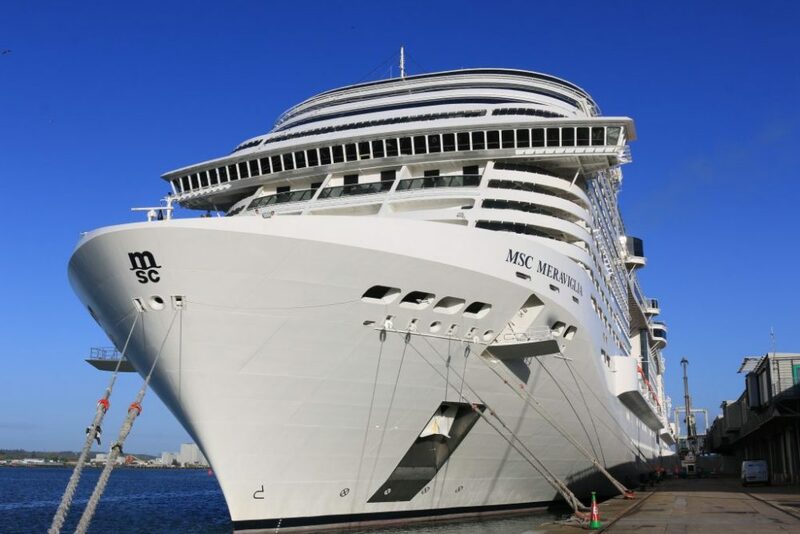 MSC are a Swiss-Italian cruise line, fourth largest in the world and family-owned. Their ever-extending and popular fleet consists of a number of new stunning ships, with many more are due to join the service in the next couple of years. As a company they are all about relaxed cruising, there are no forced formal evenings. Sounds like heaven to me! MSC are also very family oriented. They have wonderful family cabins easily sleeping a family of 5, or a group up to 10 people. 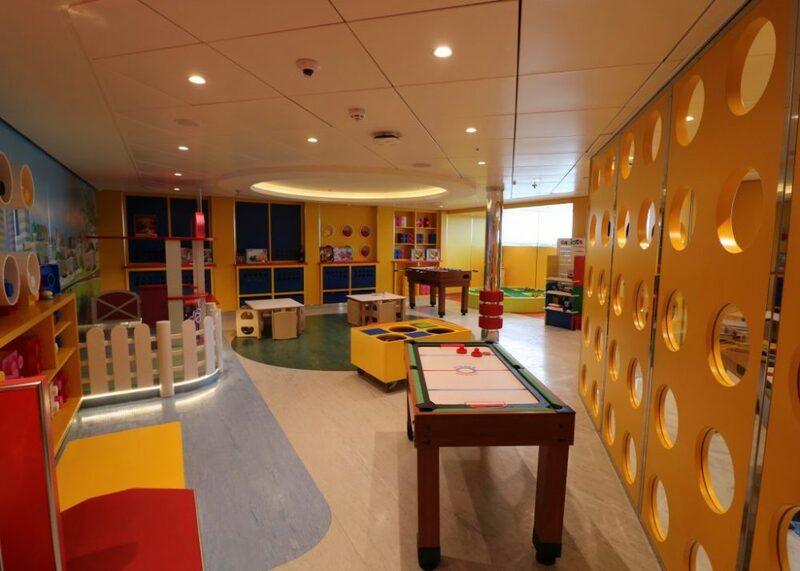 Naturally, there are excellent facilities for kids onboard so that the parents get to enjoy their holiday too. Plus, MSC offer low kids’ fares up to 17 years of age, unlike some companies who stop at 12 or offer 3rd or 4th person discount. 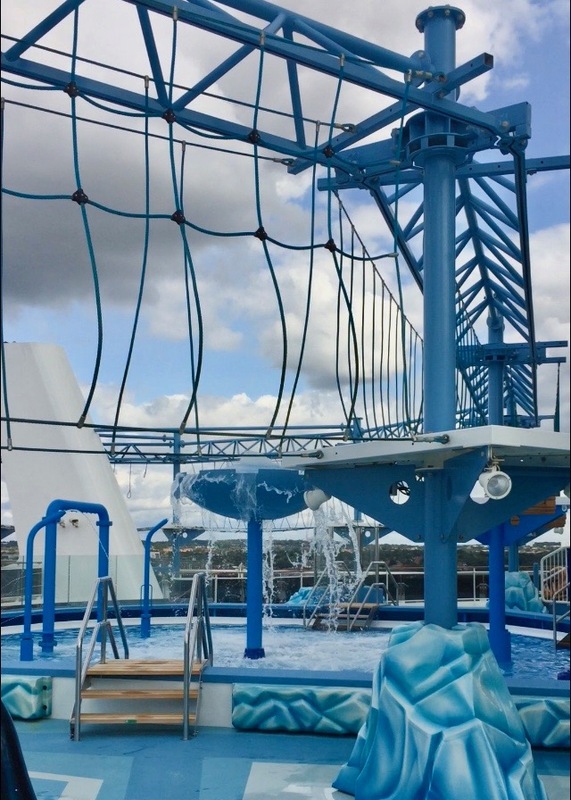 The newer MSC ships have water/splash parks onboard to keep the kids happy. The latest two MSC ships have added zip lines even, to keep the brave busy. And big-name entertainment for the grown-ups, but more on that later. Very few cruises are fully all-inclusive (AI) with drinks included in the cost. Those that do offer drinks as standard tend to cost more to book. So most cruise lines offer soft drink and alcoholic drinks packages as optional extras. Unfortunately, in most cases these packages containing alcoholic drinks can set you back 60USD per person per day (pppd). It is a big expense to add-on. But not on MSC, I am glad to tell you. Standard AI at the time of writing on MSC’s European departures is only 21EUR per person per day. Even the premium package, containing premium brands, a wider range of products including unlimited champagne, is only 40EUR a day. Still cheaper. 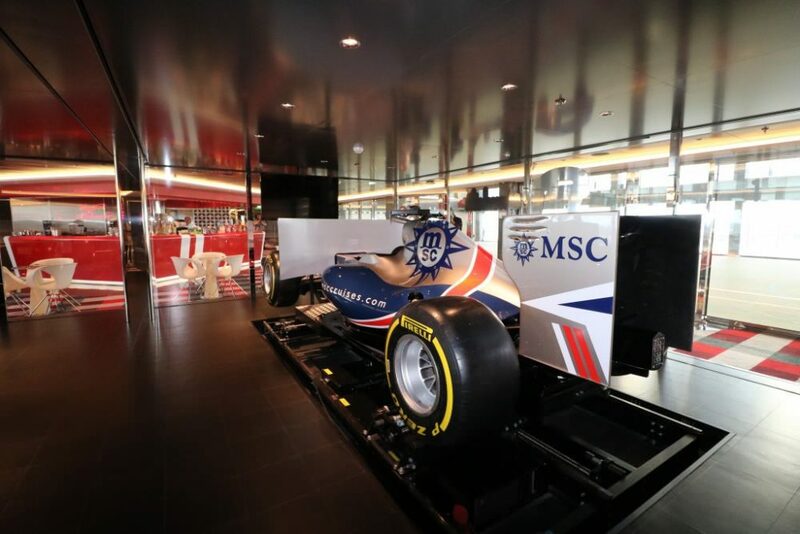 So you are fan of relaxing on the pool with a frozen cocktail at hand, with the prices of packages MSC offers, you don’t have to even think twice about adding the cost of the AI product to your booking. And in some cabin types, it’s already built into the fare! 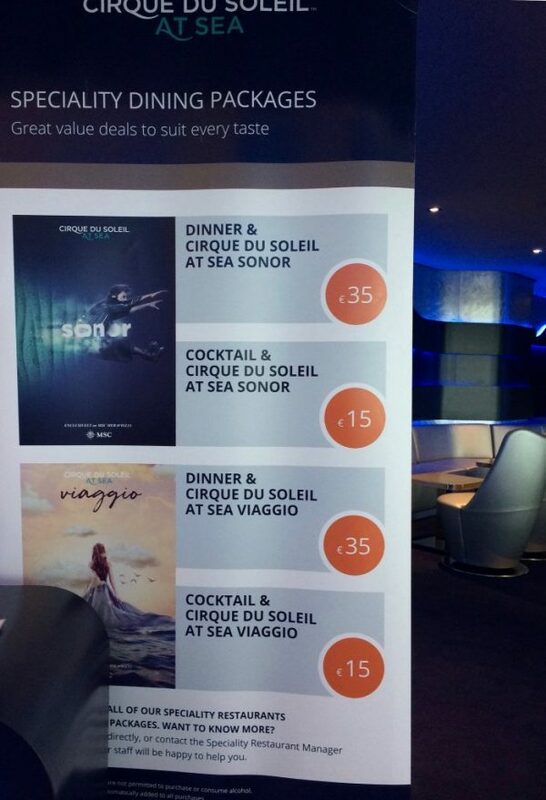 The entertainment onboard isn’t naff either, ships like Meraviglia have Cirque de Soleil shows onboard. 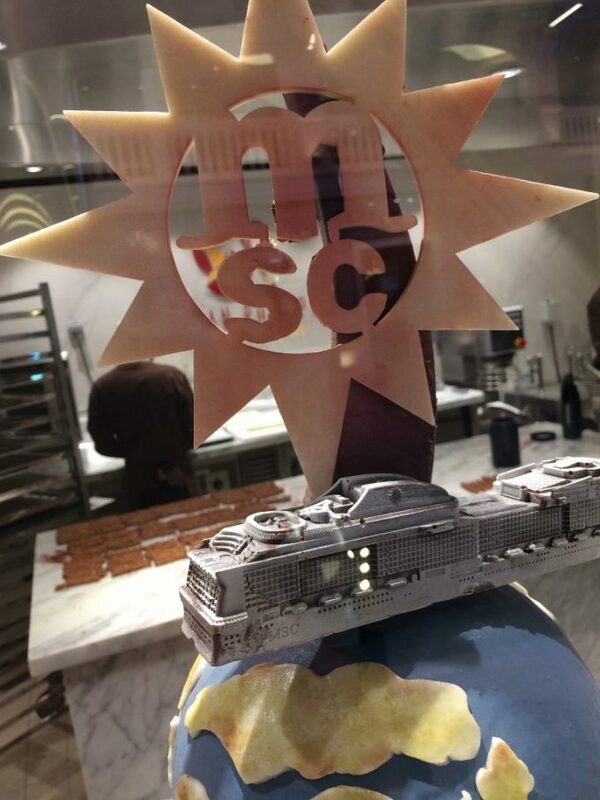 And the average age of cruiser on MSC is over a decade under the industry average. Sounds good, right? Now, lets review Meraviglia for you. The marvel that is Meraviglia actually means ‘wonder’ in English so I wasn’t just trying to make a bad pun with the headline. And in case you’re tongue-tied and unsure how to ask your cruise specialist travel agent to book you onboard, the name Meraviglia is pronounced with a silent ‘g’. Prego, andiamo! You’re welcome, let’s move on with the review of the day! 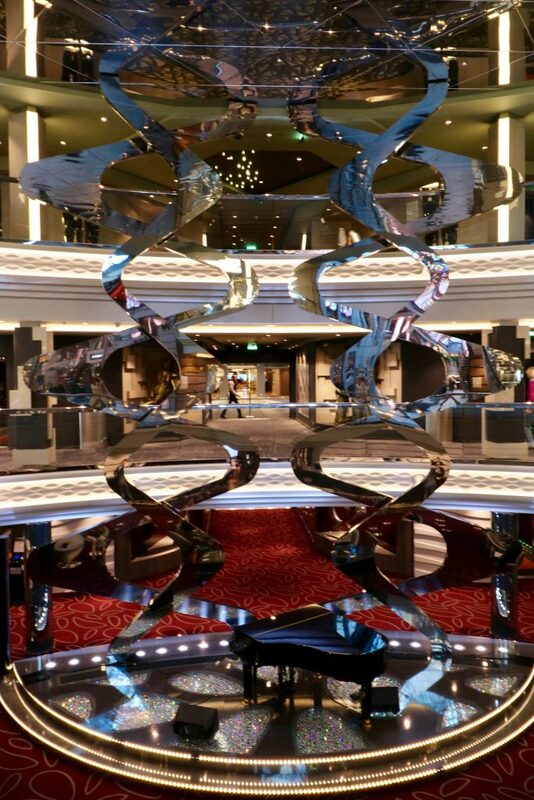 Be prepared to be dazzled as you enter the three-story Infinity atrium on deck 6. It’s a glamorous airy & glittering affair with a stunning silver mirrored spiral centrepiece covering the height of the atrium. And typically for MSC, the one thing you see upon entering the Atrium are the stunning, famous Swarovski staircases. 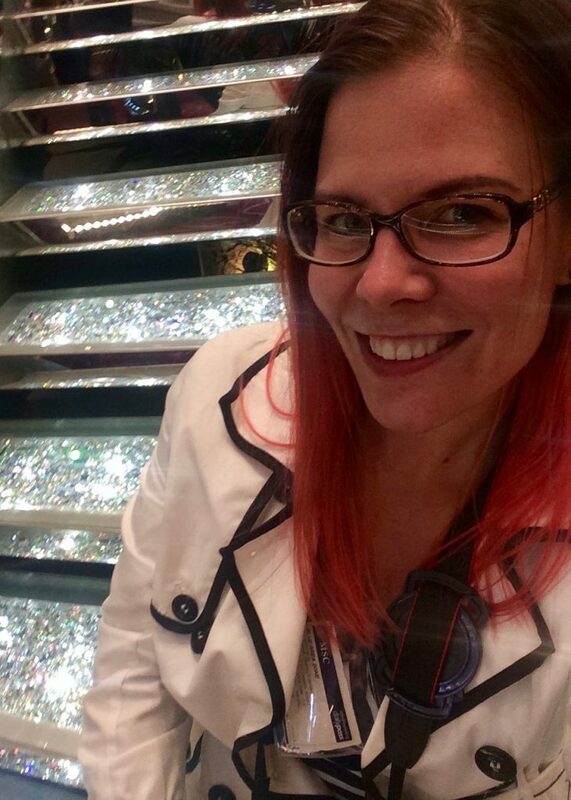 I don’t think you can say you’ve sailed MSC if you haven’t had a photo taken on these stairs – or at least had a photo of your feet on them. 15,000 Euros per step, apparently. Don’t think I have ever stepped on anything as extravagant. Or Sat on, on this occasion. Understandably we spent a LOT of time here for photos – but everyone does. I thought I knew what to expect based on my previous MSC experiences but Meraviglia is bigger and better, and more glamourous. 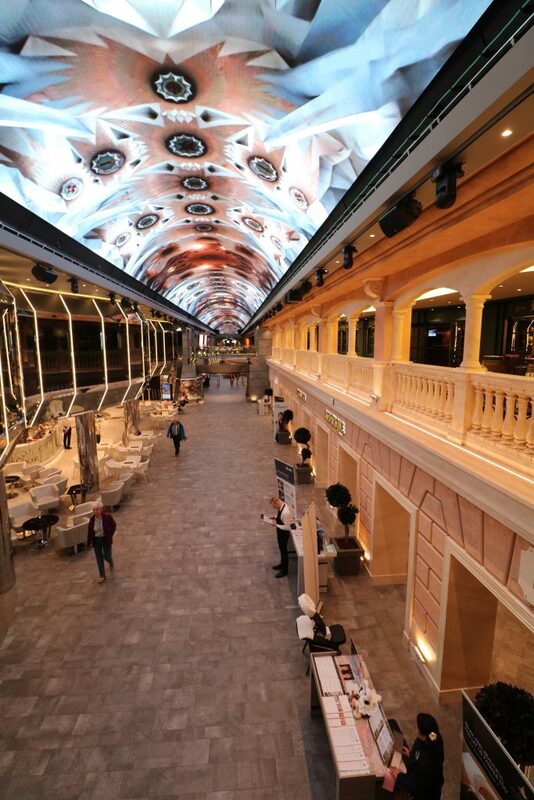 If you haven’t experienced a sparkly cruise ship atrium, you’re in for a treat with Meraviglia. 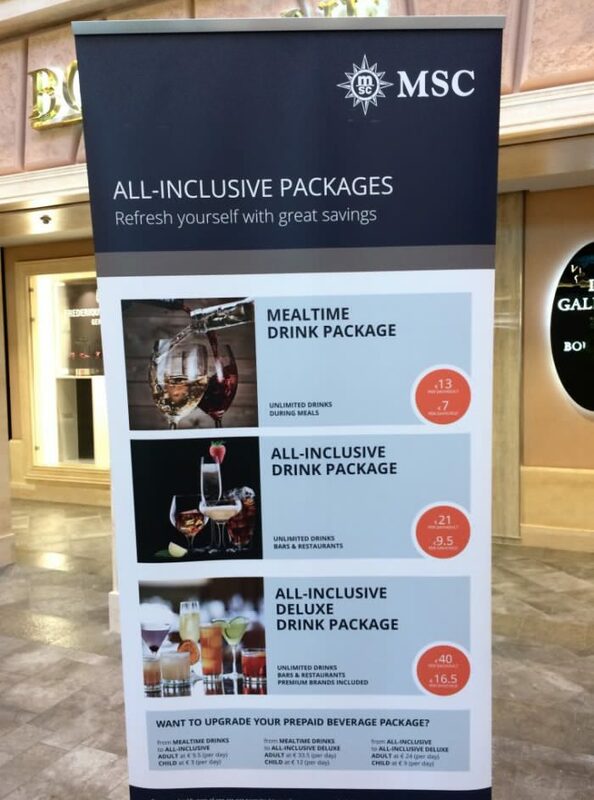 As expected, many of the usual venues to be found here in the Infinity atrium, guest services, and one of the many stunning designer bars… to use that excellent value drinks package in. 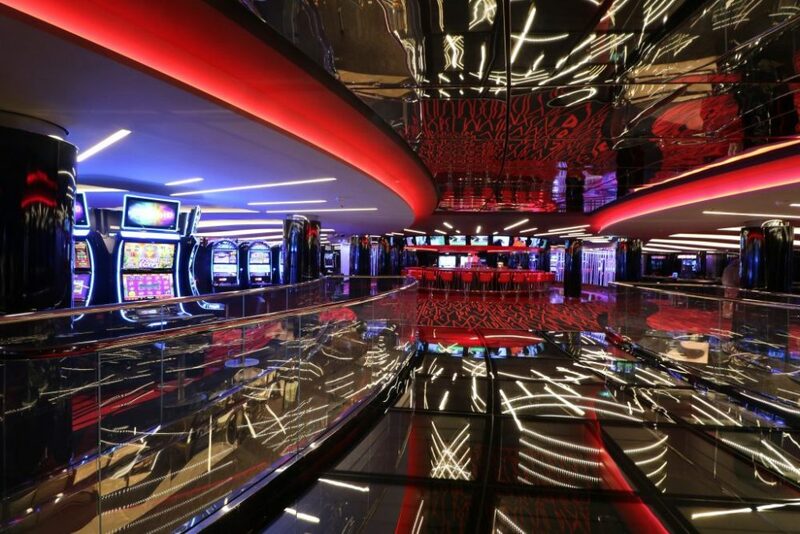 The view from above is even more beautiful as you can glace through the Infinity centrepiece towards the promenade leading to two of the many dining rooms. 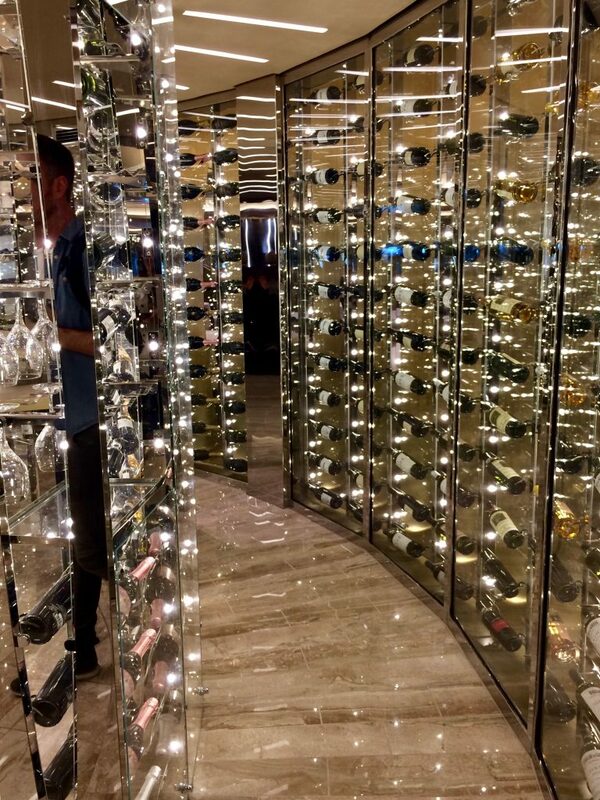 There’s a beautiful wine storage display and Enomatic wine dispensers if you want to try some of the more premium wines by the glass. Considering the sparkly entrance and the extravagance of the Atrium, I was surprised to see how understated the L’Olivo d’oro and the L’Olive dorée located right across oneanother appeared. We didn’t get to see the other dining room Panorama or the Waves to see how they compared in decor. From the dining room end of the open Atrium, you get views into the stunning two-storey Galleria opposite. 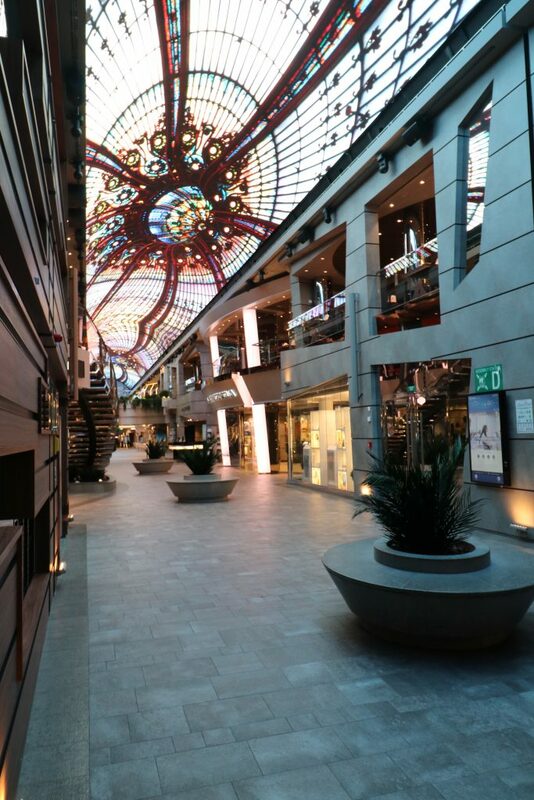 The Galleria is an amazing LED domed street that takes the idea of Royal Caribbean Promenade – but delivers it with more European class & style. The LED dome is the largest screen out there on the oceans, 262ft in length. That means very little to me as I still think metric after 20yrs… but if you allow me to check – it’s 80 metres! The stunning designs changes at regular intervals, from various pieces of art to animate underwater scenes to MSC history and more. I would’ve loved sitting underneath the Gallery and catch it all on a timelapse but there are lots of Youtube videos out there for us all to enjoy, thankfully. 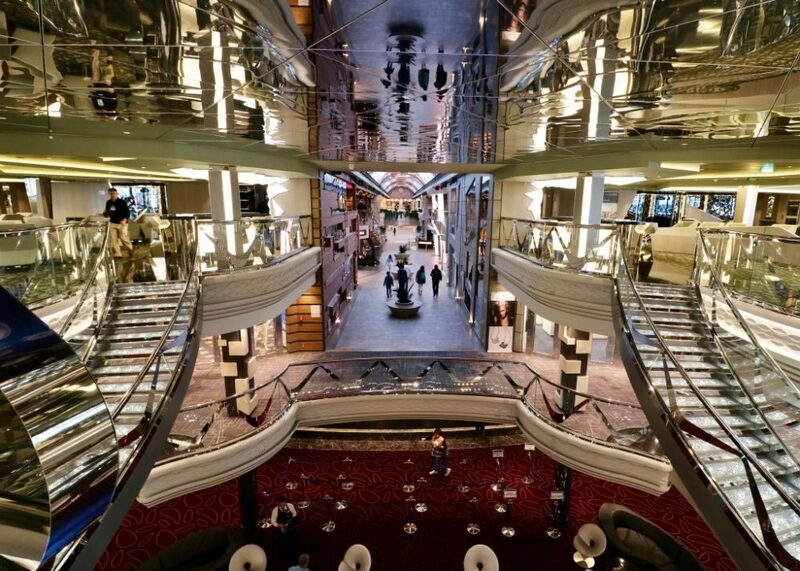 The trendy Galleria promenade has a number of venues along it to keep you busy over your cruise holiday. 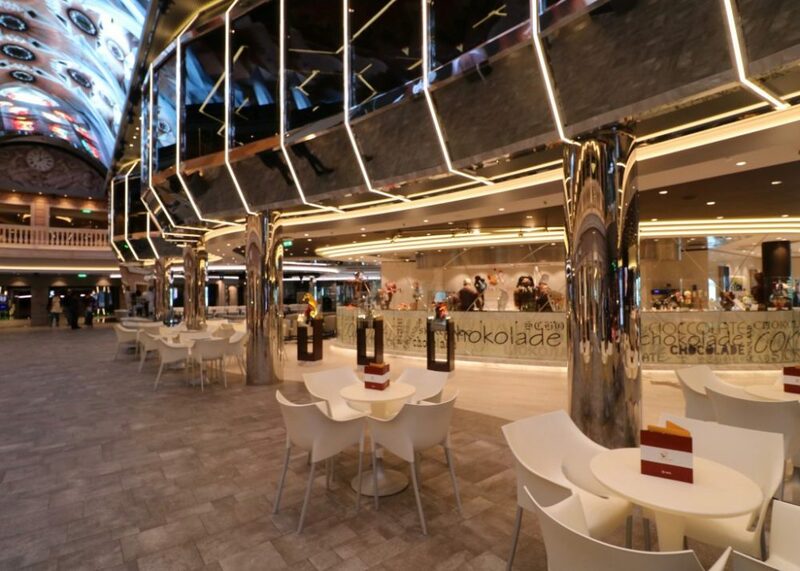 You’ll find the Excursion desk here, various shopping venues, extra dining options and places for sweet treats. 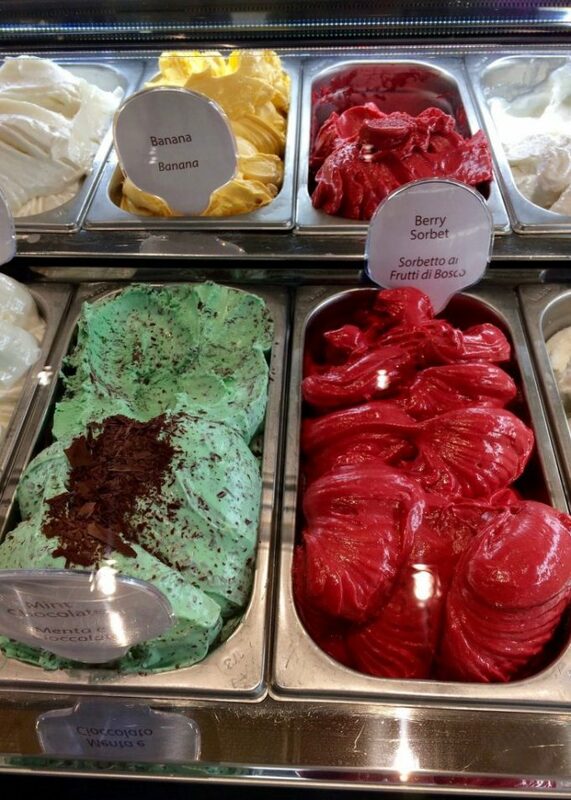 There is even proper Italian gelato & crepe venue, which thankfully serves sorbet (the vegan option) and vegan-friendly smoothies too. Nearby on the Galleria is a venue unlike anything I’ve ever seen.. or smelt. 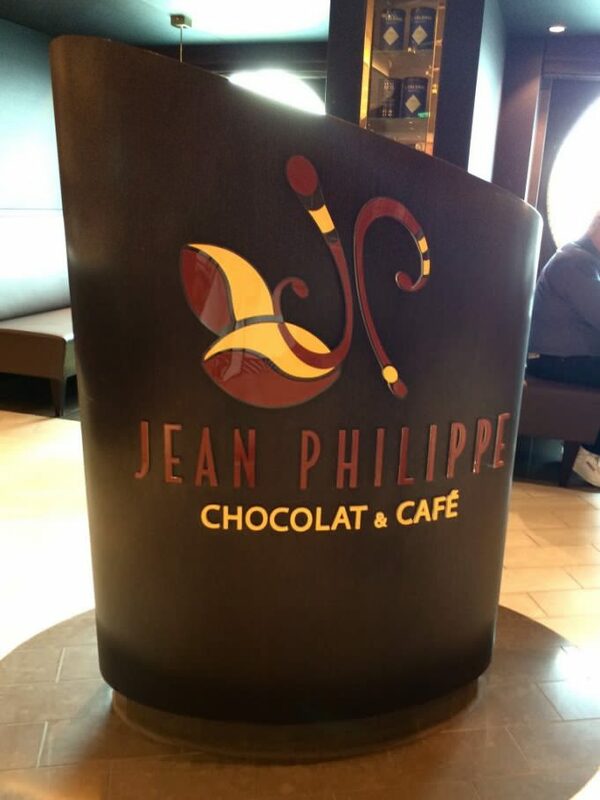 This cornucopia of chocolate art and other delicious treats like macarons is ‘Chocolat & Cafe’ by world famous chocolatier & patisserie chef Jean Phillippe Maury. 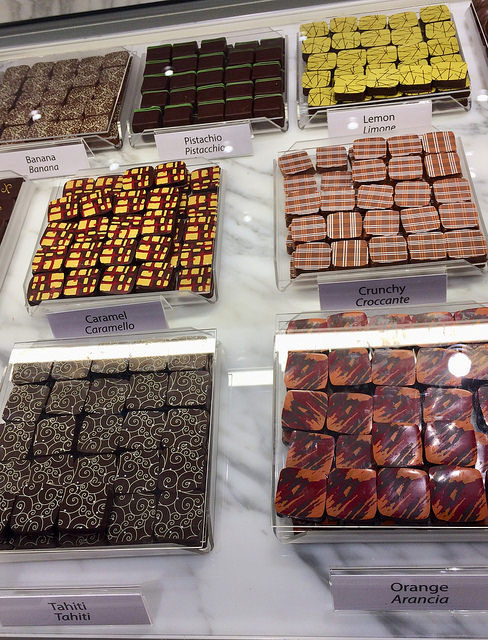 The air in this place is heavy with cocoa and the extravagant pieces of chocolate art on display will have you aah’ing in amazement. Just like the edible goods in this venue. 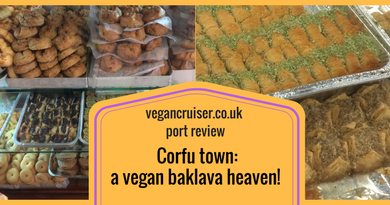 Unfortunately for me, out of the handmade confectionery for sale only once piece was dairy-free and vegan. Apparently the dark chocolate Meraviglia is dairy free too, if you get a serious chocolate craving. 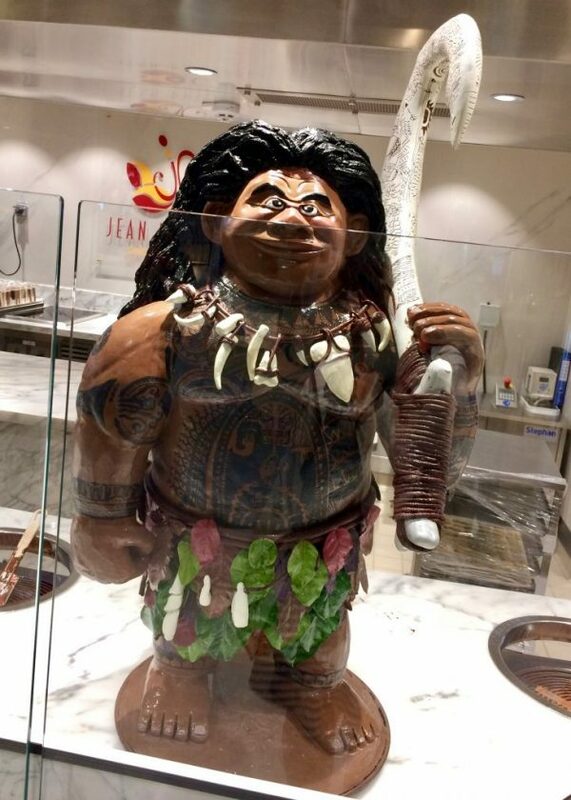 It is big, and solid chocolate – be warned! 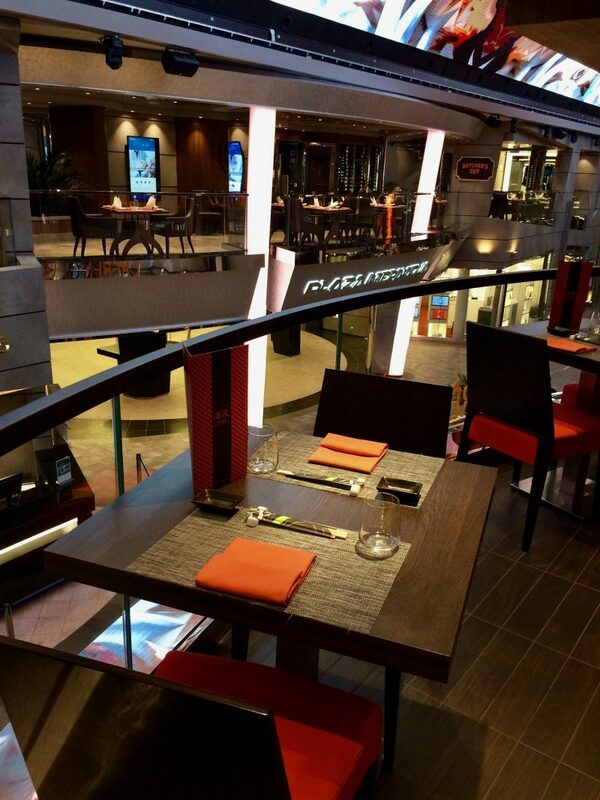 Up one deck on the Galleria Mezzanine and around it you will find more dining and drinking venues and perfect for people watching folk on the lower Galleria… so many bar venues to take advantage of that excellent AI package. 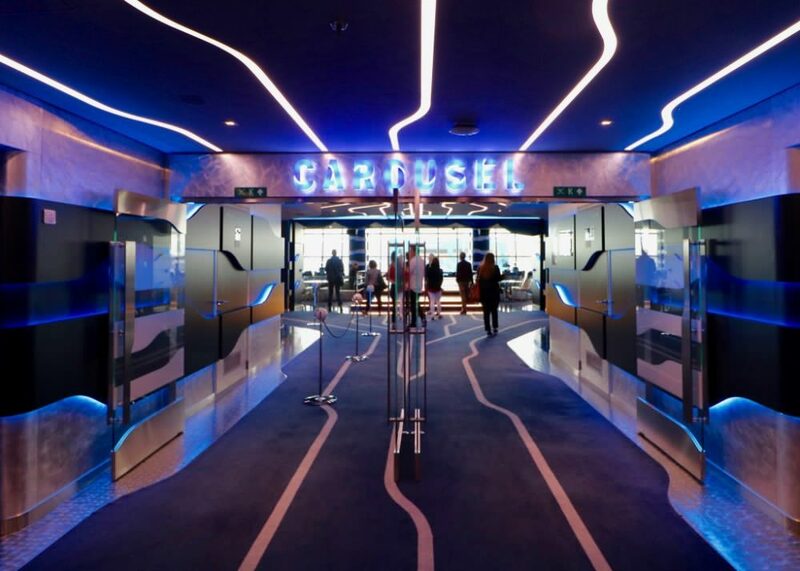 Whether you are looking for comedy shows, quizzes, games or karaoke, the onboard TV Studio & Bar will entertain you. Or you can watch their broadcasts on your cabin TV while getting ready for your evening activities. Perhaps you’re not the cocktail kind and karaoke isn’t to your liking, fear not. 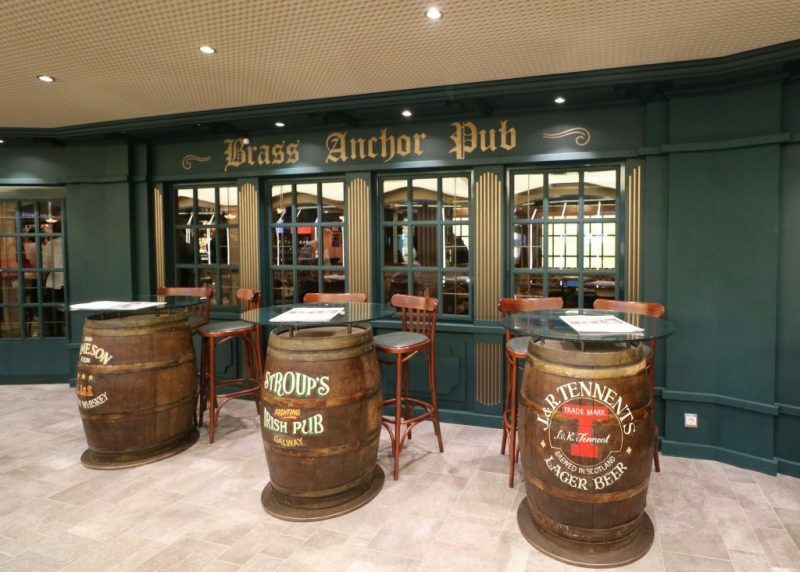 MSC Meraviglia as a British pub onboard and you’ll find it right across from the TV Studio & Bar. On tap you will find a good range of draught beers. 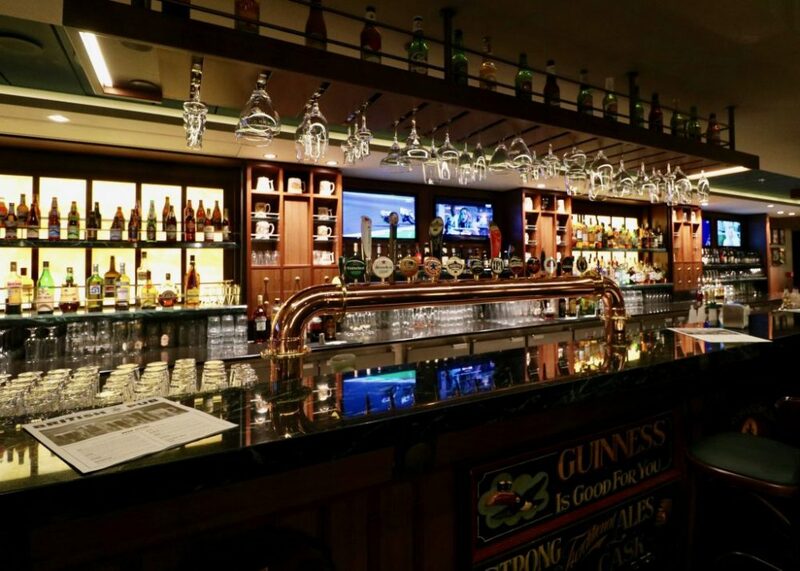 They also serve an exemplary range of bottled beers, craft beers and some ciders as well. Even beertails..
Next door to the English pub you’ll find Meraviglia’s Asian dining experience: the Kaito sushi and teppanyaki restaurants. 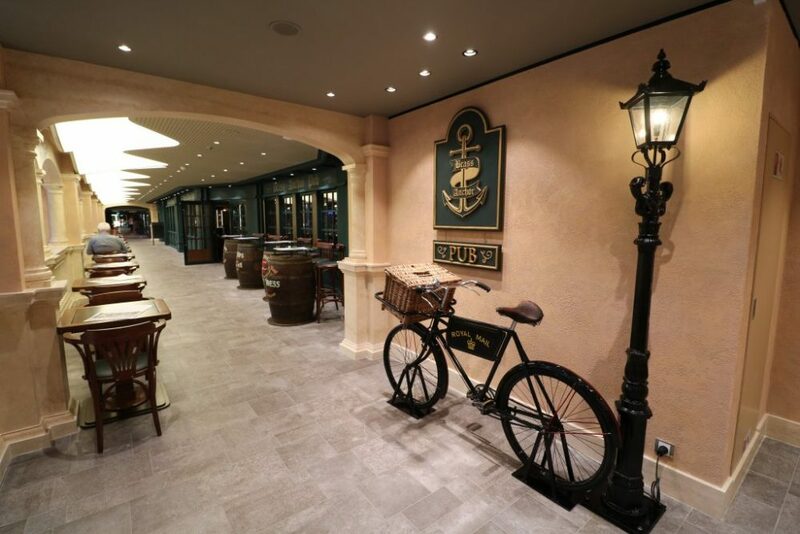 It’s not all Italian food onboard, although if that is what you fancy, the Italian specialty restaurant Eataly is located downstairs. Across the Galleria on the opposite side is the Butchers’ Cut Steakhouse too, but as you can expect, I did not investigate it further. 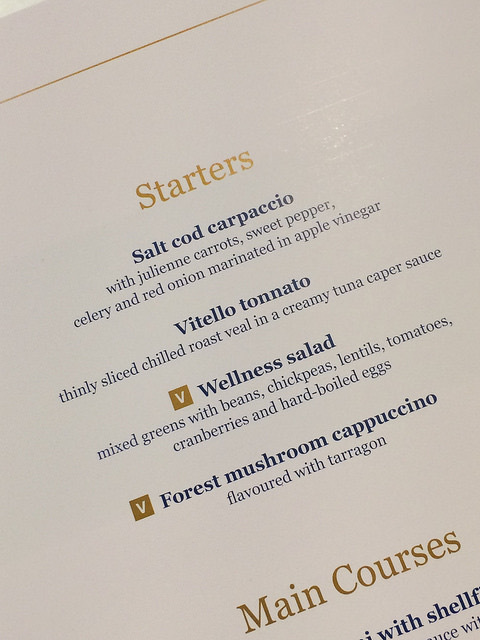 The fantastic value AI drinks package has prosecco but if you opt for the premium version you have Nicholas Feuillatte available in all bars…and during the opening hours of the Champagne bar, unlimited Laurent Perrier as well. 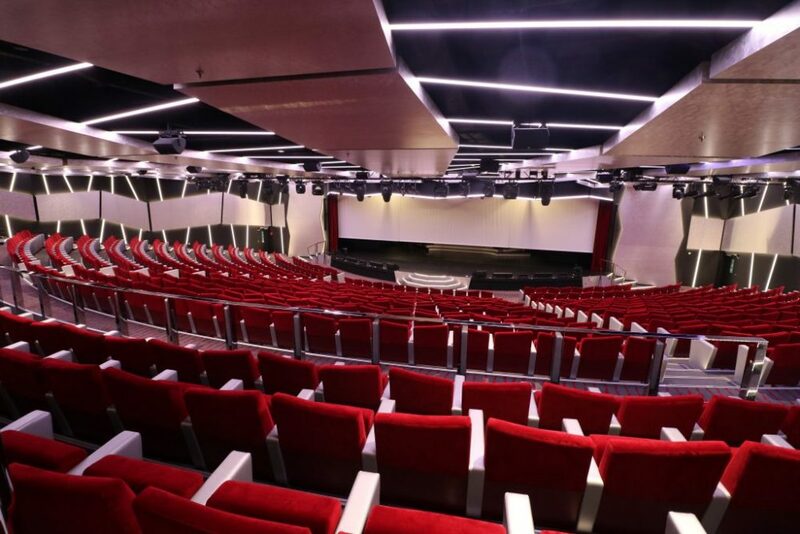 The Galleria and the nearby venues form the beating heart of the Meraviglia and are a hive of activity. Should you want to enjoy a drink somewhere a little quieter you have that in Sky Lounge. 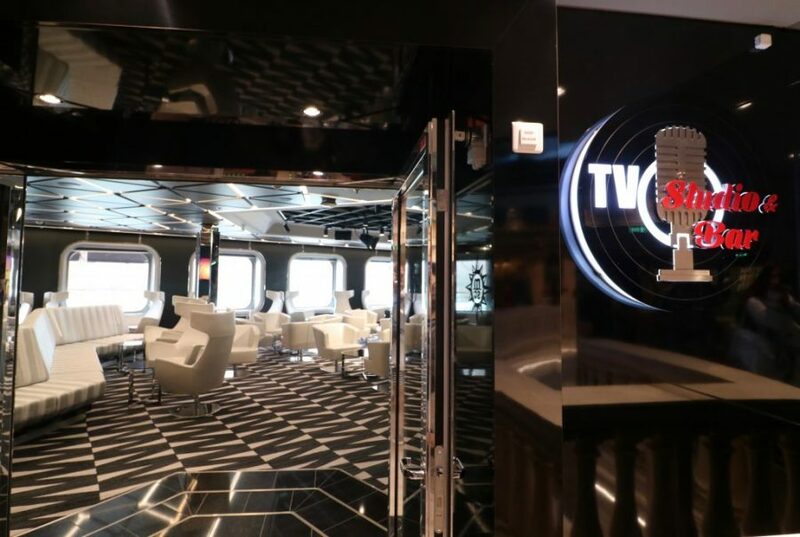 It is an adult-only bar venue up on deck 18 (the second highest there is). 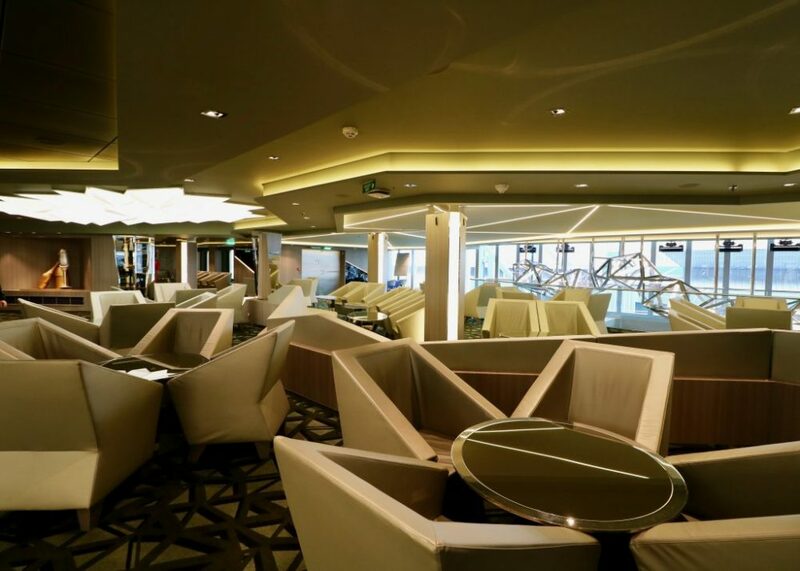 For its excellent ocean views, the Sky Lounge rivals Royal Caribbean’s Crows Nest or Celebrity’s Sky Lounge. Sky Lounge also serves tapas-style nibbles so that you can imbibe in a respectable fashion. The bar range includes some fancy molecular cocktails, bubble tea style. Far forward on deck 7 (which also is the home for the upper Galleria venues), you will find the centre for all things pampering – the large Balinese themed Aurea Spa. We didn’t get to tour it but you can see some spa info & photos from Splendida’s Aurea Spa here. You can buy daily or a weekly pass for the thermal suite in addition to spa treatments including 20 different styles of massage. By booking one of the premium Aurea Spa cabins, your access to the thermal suite is included in the fare as are a number of spa treatments too. Passengers in Yacht Club cabins or suites have free access to the thermal suite as well – but more on that option later. The only venue that in terms of colour use reminded me of the other MSC ships I have been on is the onboard Casino. Meraviglia appears to be much more muted in her tones – except for the bold reds in the casino bar. At the back of the brightly-coloured casino is the Carousel lounge, the purpose-built theatre for Cirque de Soleil shows Sonor and Viaggio. Tickets to these two aren’t included in the cruise fare but are reasonably priced. You can either book a show with a drink or a show with a meal. It was difficult to imagine what the Carousel venue is like at night, visiting it in bright daylight. Hopefully this evening photo will help you appreciate this purpose-built Cirque venue. 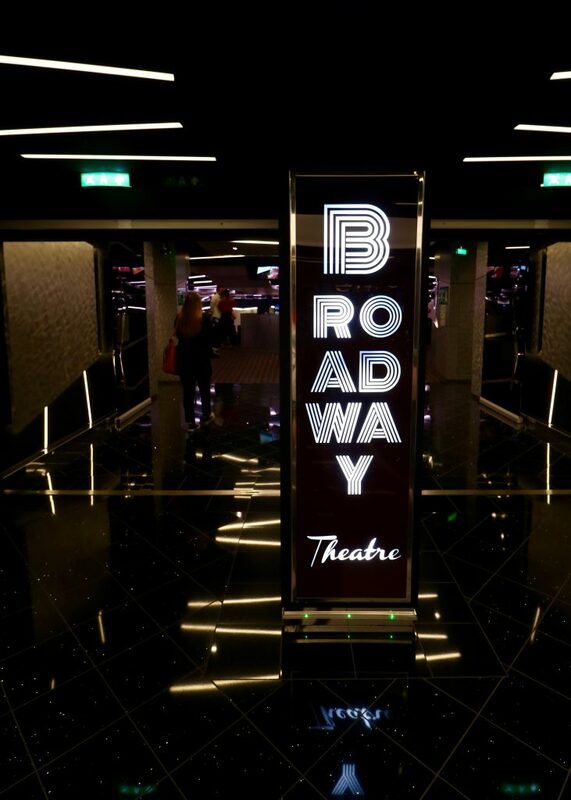 If Cirque isn’t your thing, or you don’t want to spend extra money on shows, there always are nightly free shows in the Broadway theatre, or live music & events at other venues… such as the TV Studio bar. But what about daytime activities? 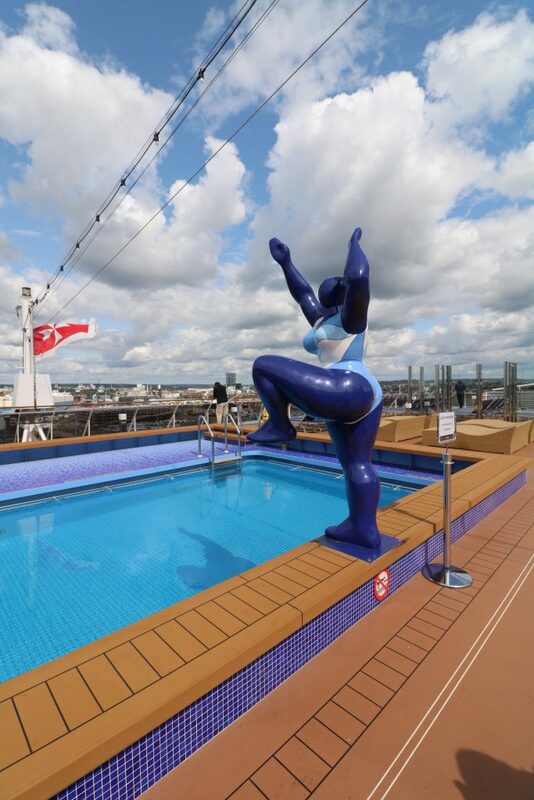 You’ll be off ship exploring the various ports but if there is a sea day, or you just want to return onboard early, there’s much to splash in and laze about. 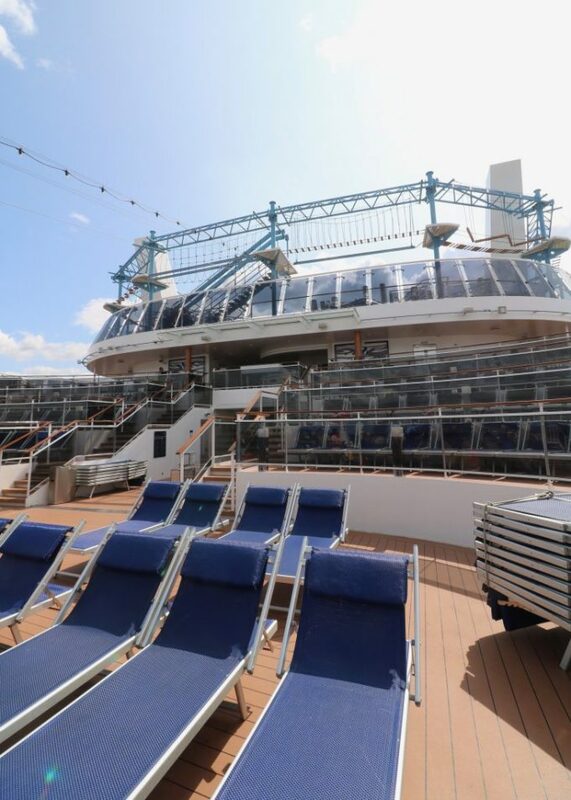 The highlight of our review tour of Meraviglia for me the “Atmosphere’ main pool on Meraviglia. So long, so classy! 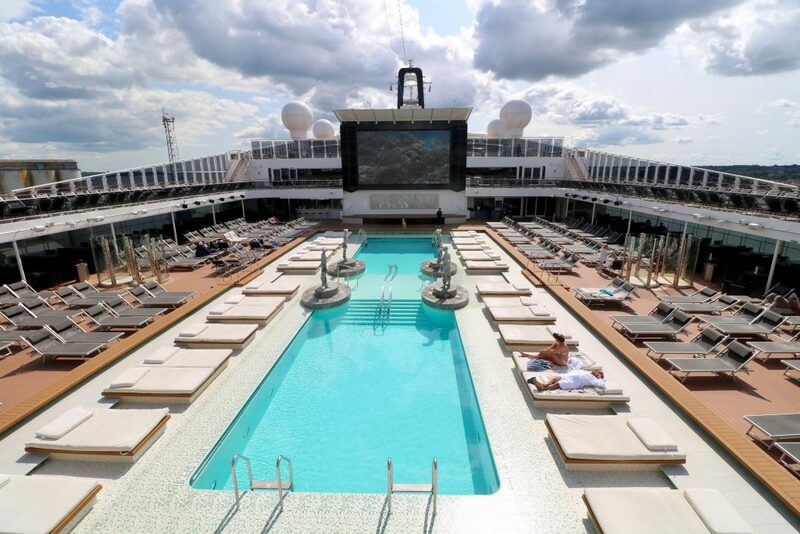 And I loved the comfortable double loungers by the pool – normally these would be in exclusive paid-for adult only decks… but if you’re fast enough, you can have one by the main pool on MSC Meraviglia. And there’s the big screen for entertainment. For rainy days or for cooler winter cruising, there is a 10m inside pool as well – and this Bamboo pool has a retractable roof for sunny days. The Bamboo bar also has bubble tea on the menu – how cool is that? I’ve never come across any on cruise ships. 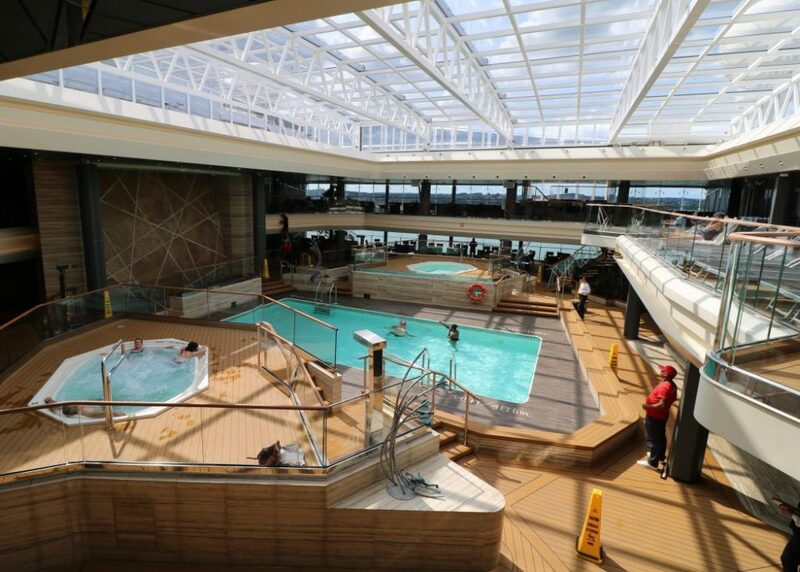 Right at the aft (end) of the ship, there is one more pool, called the Horizon pool. Apparently at night this poolside and it’s tiered seating area turns into a dance space. I’m a lover of wake views so I would I would park myself here when out at sea. Plus, something else I enjoy, is right behind. You’ll never be alone at the Horizon pool. Just like the main Atmosphere pool, it too has a piece of art by it – just something a bit more livelier and colourful. Above the Horizon pool is one of my favourite venues, the Polar Aquapark with splash park and rides. I love a good water slide and so wanted to test the ones onboard. Meraviglia has three water rides, two enclosed tube rides you use with inflatable rings. The third slide, the ‘Champagne Bowl’ is a traditional high-speed water slide. For kids, and big kids, the Himalayan Bridge rope course is here als. 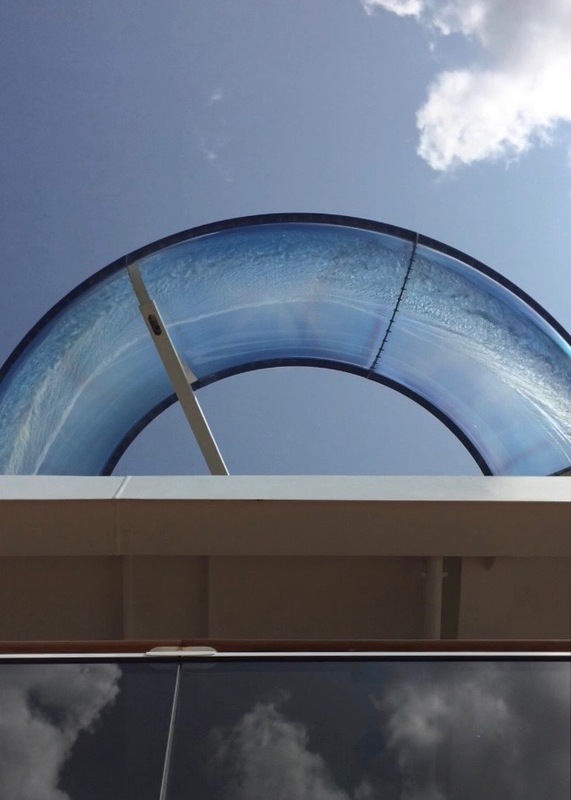 It runs the width of the ship over the Aquapark and is visible from the Horizon pool area, as you saw earlier. For those looking for indoor activities, there is much to keep you entertained and active. And fear not – it isn’t Bingo or Bridge. 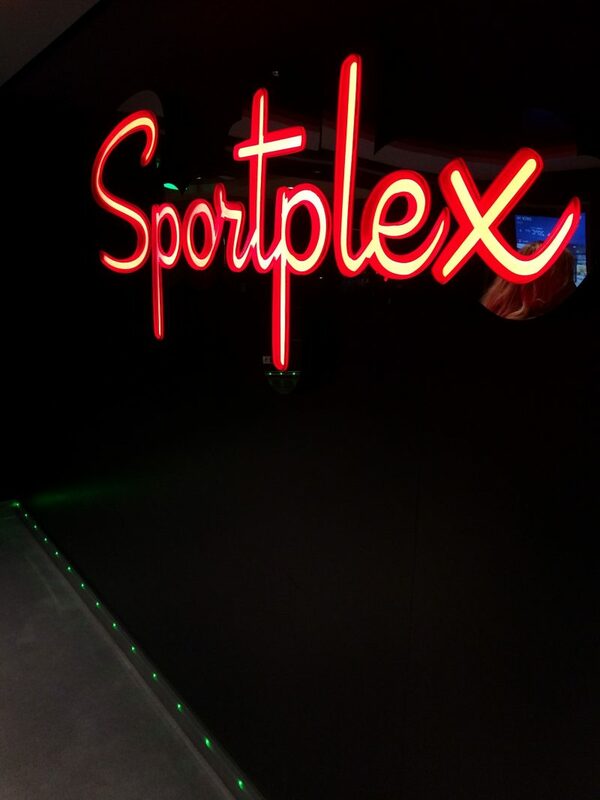 During our Meraviglia review tour we got to peek into the nearby Sportplex. 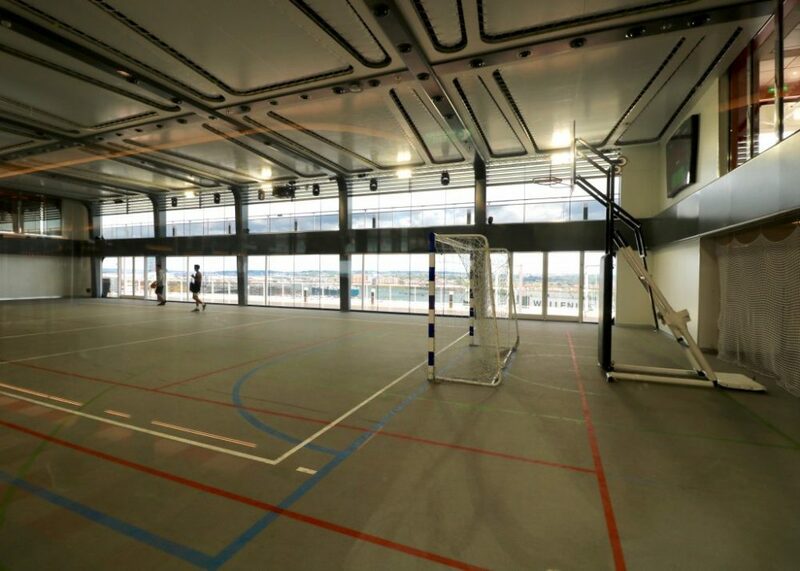 It houses a full-sized court for those wanting to play ball – and two full-sized bowling lanes for more sedate sporting activity. For fans of seated speed, there is a Formula1 and a flight simulator in this unit. Teens and geek dads will appreciate the onboard games arcade as well. 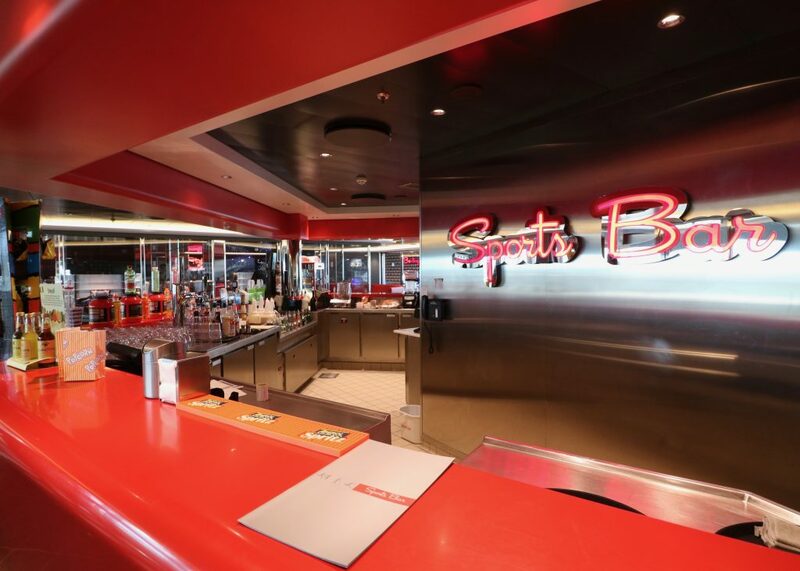 For those using the court or the gym, there naturally is a sports bar as well. The gym has a range of cardio equipment and weights, with fantastic floor to ceiling windows to enjoy the views of pool deck below and the sea on each side. If you cruise with kids, the deck above the Sportplex is where your children will no doubt spend most of their time, in DoReMi land. During our review tour we got to peek into the Baby Chicco, Mini and Junior rooms – the teens had an event on, so we couldn’t see their facilities but no doubt it is just as well-equipped as the other rooms. 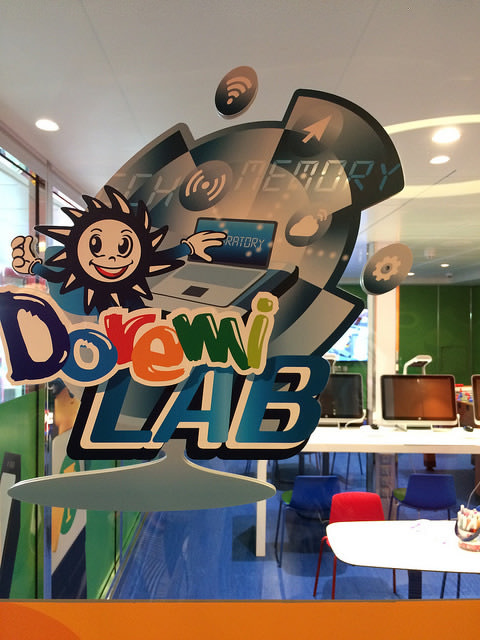 A surprise to me was the kids’ facilities also include a DoReMi lab with computers and a 3D printer to play with. The teens will be pleased to hear they have their own nightclub located here. No more having access to the adult venue and getting kicked out at 10pm, like in my teen cruising days. 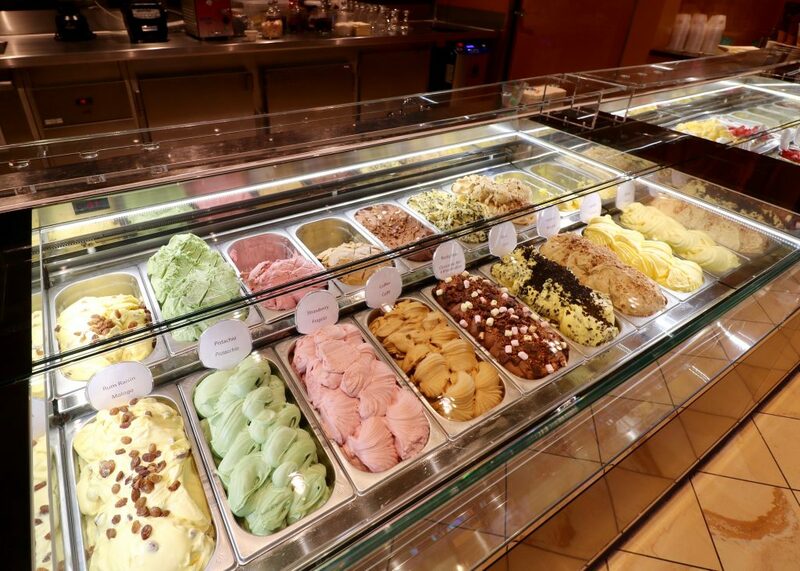 The buffet on Meraviglia is open for 20 hours a day.. you’re not likely to go hungry on the four hours that is shut. They serve the wonderful Italian pizza here. I’ve had cheeseless vegan pizza on another MSC ship but when I quickly glanced at Meraviglia’s pizza station, all appeared to be made with cheese. I’m sure they’ll accommodate though if you need yours dairy-free. 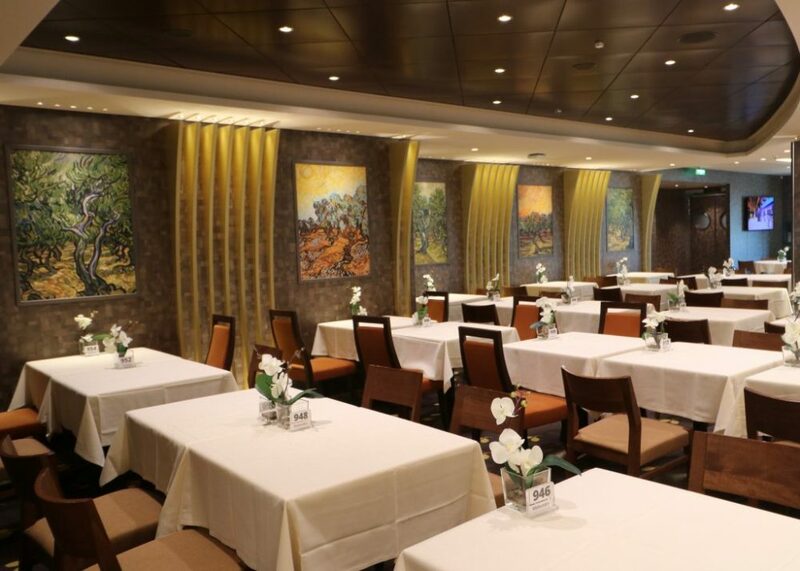 In addition to the inclusive buffet, there are a number of dining rooms offering traditional set (time) dining and anytime (turn up when you feel like it) dining. There are 12 dining venues onboard and four specialty venues I already mentioned above, all located around the Galleria. 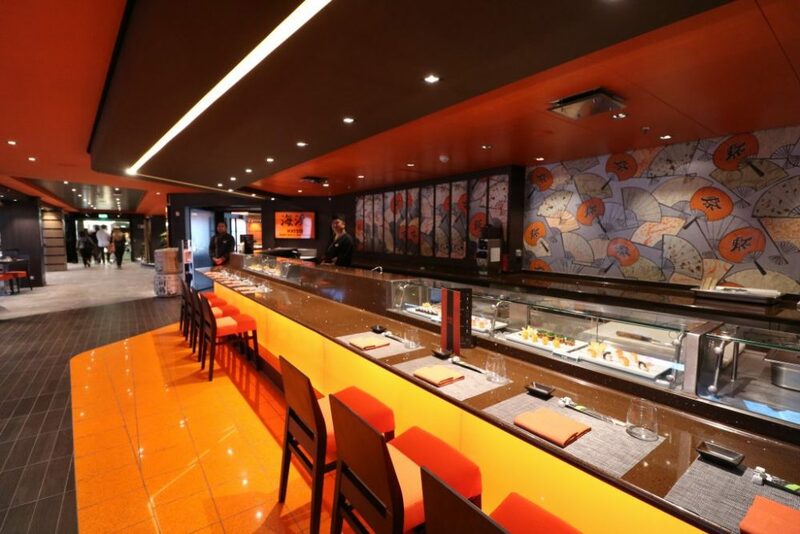 The sushi, teppanyaki and the steakhouse are on upper level. The Italian-themed Eataly set dining experience in the on the lower level. 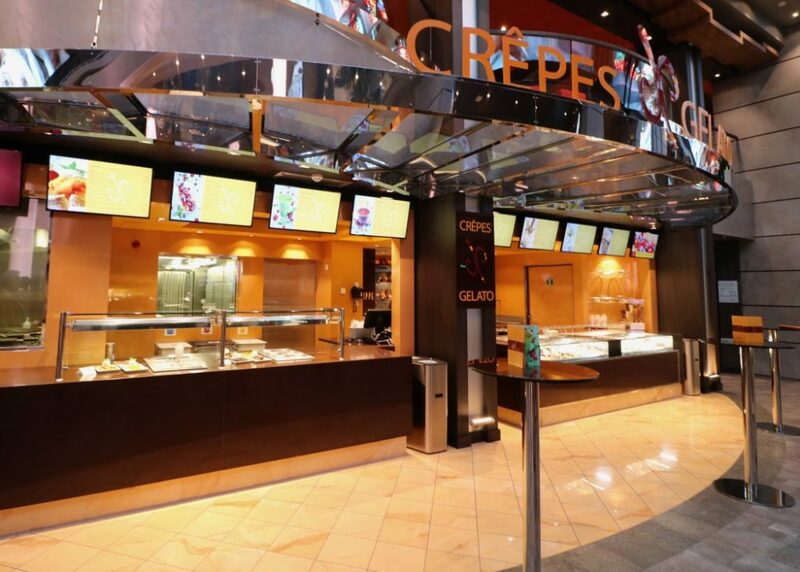 Nearby you will find the stunning Chef Jean Philippe Chocolat & Cafe coffee shop and a creperie gelateria for more sweet specialty treats. But what about the cabins? As Meraviglia on our review day was mid-route, and sailing at full capacity, we had no access to cabins. If they are anything like I enjoyed on sister Splendida they’ll be great. 75% of all cabins onboard have balconies but there are 14 types of cabins available to book, from solo cabins and insides to two-level suites. Family cabins can sleep 5 and connecting three of these together can host a family group of 10. Meraviglia truly offers a cabin for every budget. And the cheapest inside cabins are not tiny either. Emma from Cruising Isn’t Just For Old People sailed on the Meraviglia last Christmas and loved her spacious inside cabin. See her Youtube review here. 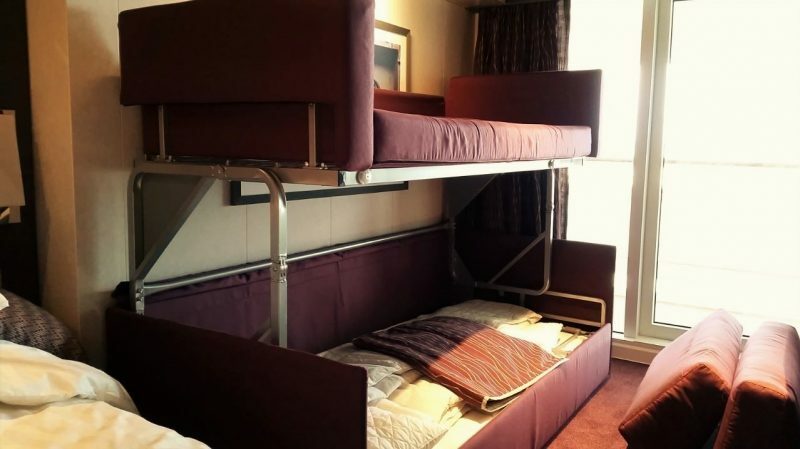 Ricky and Yves of CruiseToTravel discovered that their balcony cabin sofa turned into a bunkbed. A spacious way to fit a family of four into the same space – always preferred to having bunk beds over the master beds. 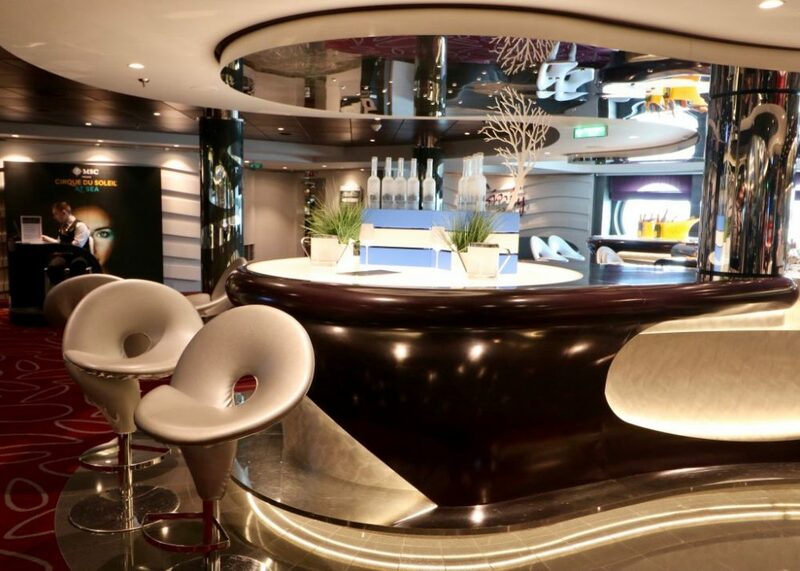 Just like some of her older sisters, Meraviglia features the enhanced Yacht Club for those who want to cruise in luxury, for that exclusive ship-within-a-ship feel. This 24h private butler-serviced area of suites (and a small number of inside cabins) has its own exclusive Yacht Club restaurant and lounge, a concierge desk for your queries, and a private sun deck & pool. Naturally, those who book the Yacht Club experience also get premium drinks package as standard and priority embarkation (and disembarkation). During your cruise, Yacht Club guests have preferential access to excursion buses as well. There also is an exclusive treatment room in the Aurea Spa for Yacht Club use. Yacht Club luxuries include finer bedding, such as Egyptian cotton linen and a pillow menu from which to choose. Marbled bathrooms are larger and offer a more luxurious experience. 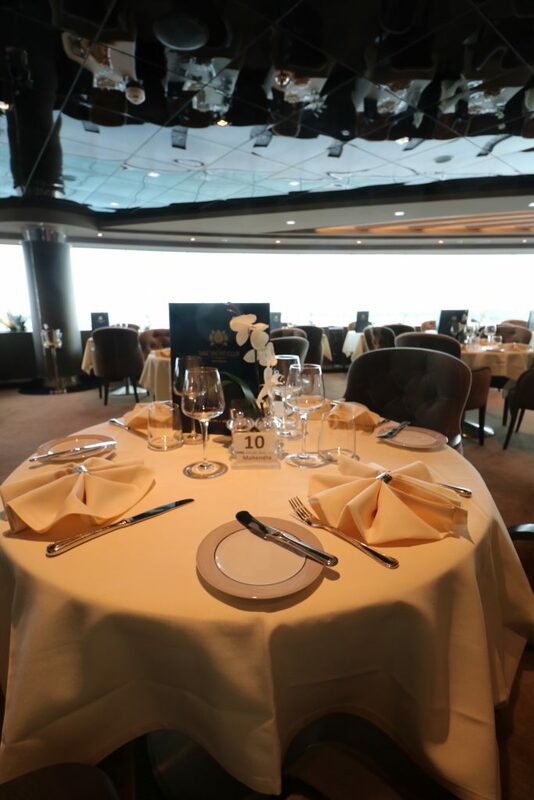 Yacht Club guests can take advantage of room service with free delivery, although the exclusive Top Sail lounge with small nibbles and the Restaurant above are never far. Minibar in Yacht Club cabins/suites is complimentary as well. 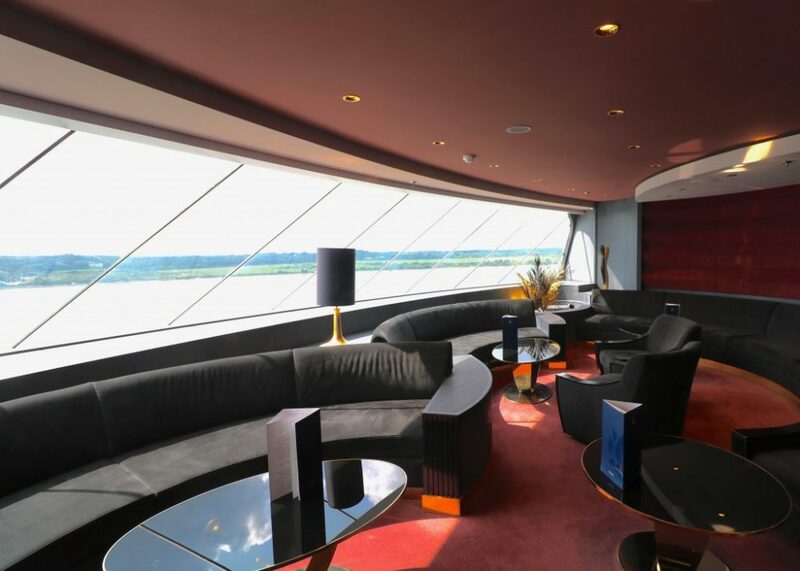 Due to the exclusive nature of Yacht Club, we couldn’t tour the area, but received welcome drinks the Top Sail lounge (pictured) enjoying the views from the front of the ship. Afterwards, lunch was served in the exclusive Yacht Club restaurant on the deck above. 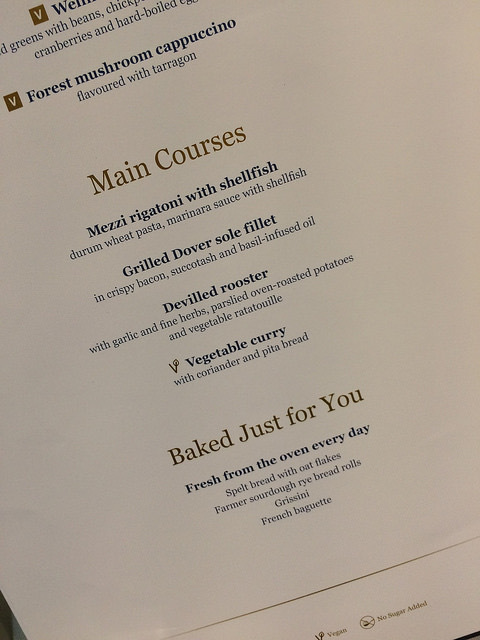 Service here was excellent, so attentive and I was pleased to be able to pick a vegan main course off the lunch menu. Only suitable starter dish was an egg salad which was made vegan for me (removing egg and the dressing). 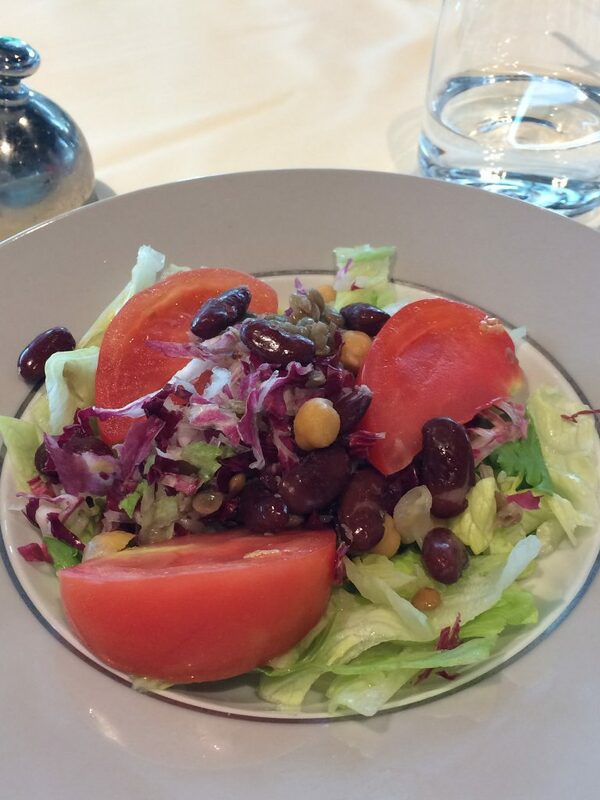 I did request a vegan dressing like balsamic but whether the waiter understood me or the kitchen ignored the request, I do not know. 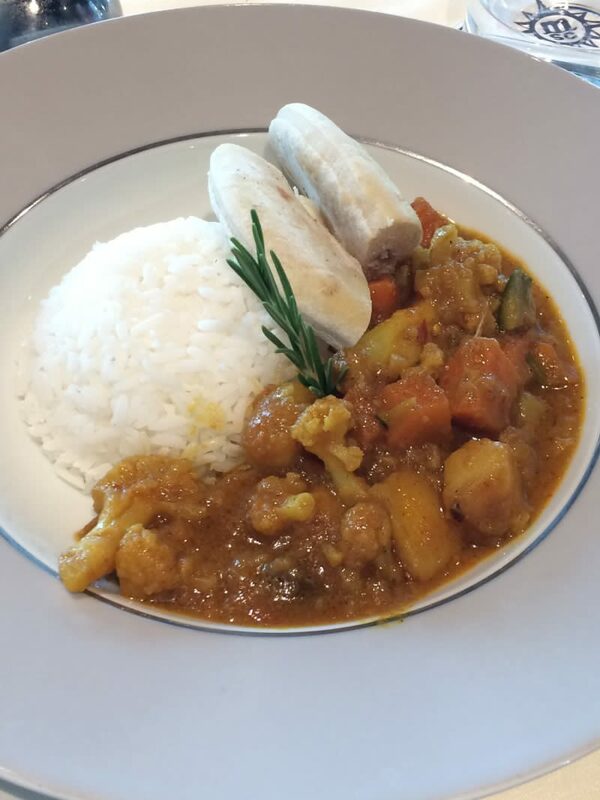 My main was a lovely vegetable curry served with rice and mini pitta breads. 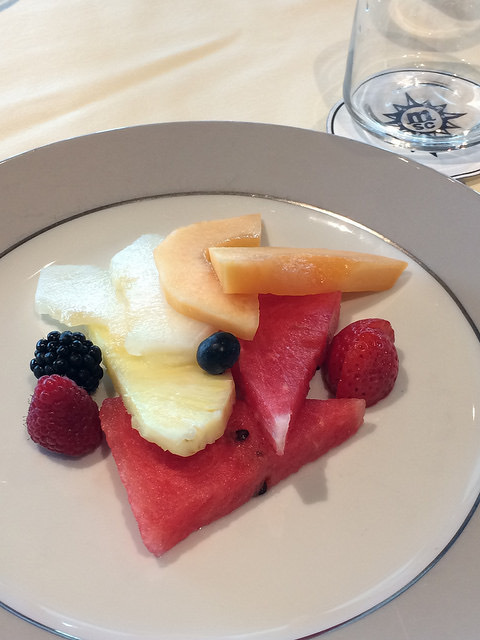 For dessert I was offered lemon sorbet or fruit platter and I chose the latter – very delicious fruit it was too. I would hope that over a course a week they would be able to offer other vegan, non-dairy desserts. All good things come to an end.. our tour did too, far too soon. There was so much I wanted to see and photograph better. I had been won over by Meraviglia’s many venues and stunning design. Yes, she’s glitzy and sparkly and certainly charms you in many ways. Perhaps she’s not for those looking for traditional cruising but not that many are – if you look at the range of cruise offering that is out there. Meraviglia is called ‘Ship for all seasons” by MSC but I would like to call her a ‘ship for all generations’ as well. So much to see and do, she caters for many ages & tastes be it food, entertainment and the activities she offers. There are cabins for every budget. For those wanting ultimate luxury and small-ship experience, the exclusive Yacht Club offers just that. While still having access to everything rest of the ship offers. Now that I have experienced Meraviglia, I am looking to book a cruise with her in 2019. For the rest of 2018 and start of 2019, Meraviglia sails on the Mediterranean. Be quick and you can enjoy her on the Med in the winter season. In April 2018 she relocates to Northern Europe for the spring and summer season, and will be offering cruises to the Baltic and Norwegian fjords from Copenhagen. And excitingly, at the end of September 2019, Meraviglia crosses the Atlantic and there will be a selection of New England & Canada sailings from New York. Later in the year she’ll settle into her new home port of Miami. I hope you enjoyed the photos from my day onboard! 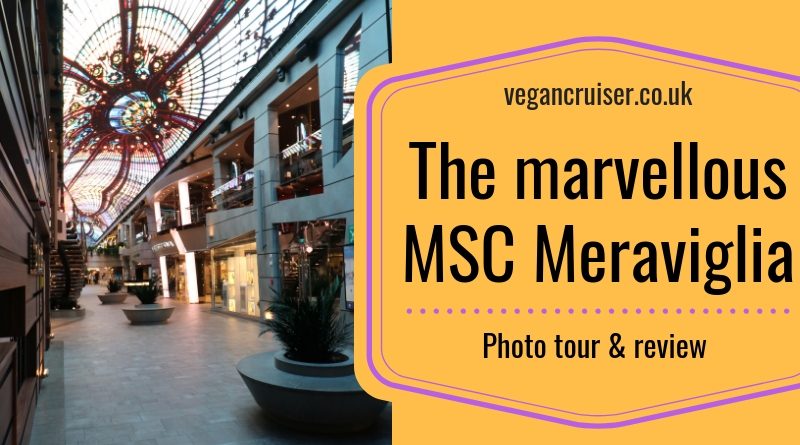 Perhaps my Meraviglia review has intrigued you to try MSC’s beautiful ships for your next cruise holiday. 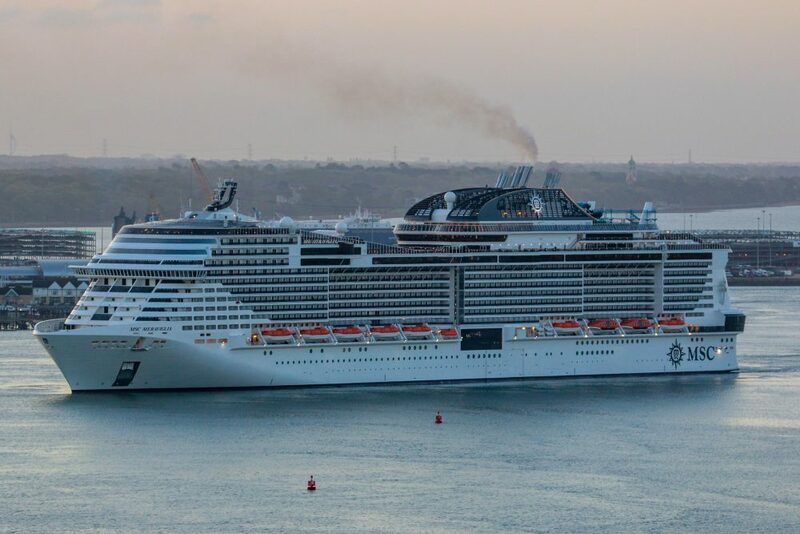 For information on Meraviglia and rest of her sisters, check out the MSC UK website (or your country local site) for fleet and price information on sailings available. You can find more about superbly colourful MSC Splendida and her sister Preziosa on my blog (just click on their names). I sailed the Splendida and visited Preziosa last year. Let me know what you think of MSC! Have you cruised them yet? 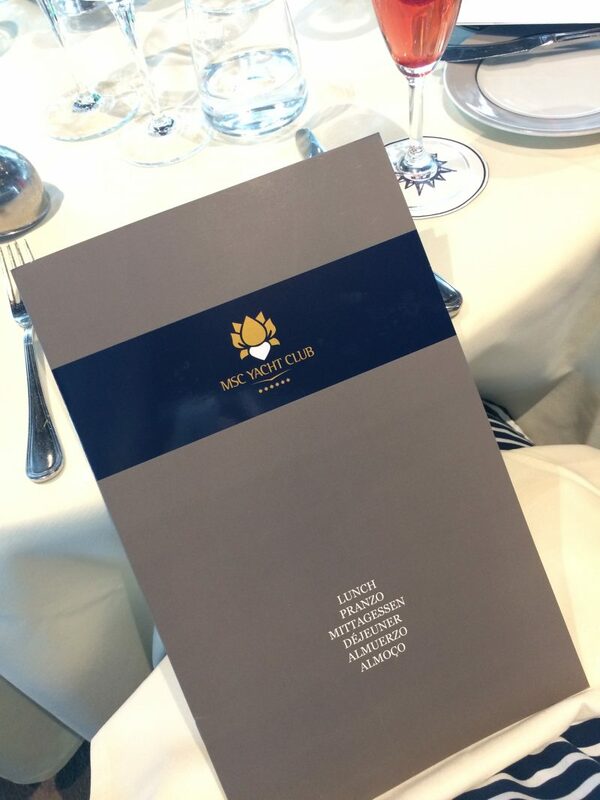 Many thanks to MSC Cruises UK PR team for the invite to review Meraviglia. I have not been paid for my review, nor have I been compensated for travel expenses. The above piece is my honest personal opinion based on my day onboard. Looks so amazing I want to go right now :). 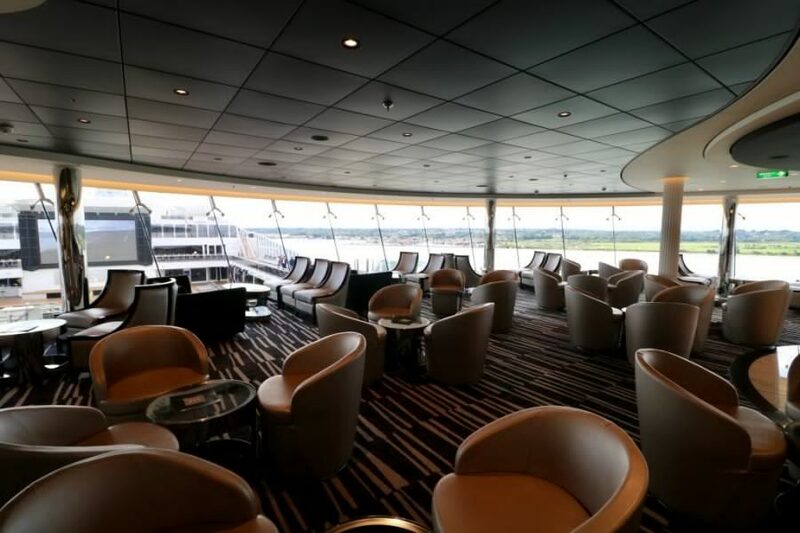 I cruised with MSC recently on the Armonia to Cuba and Mexico and although it is one of their oldest and smallest ships I still had a fabulous time. 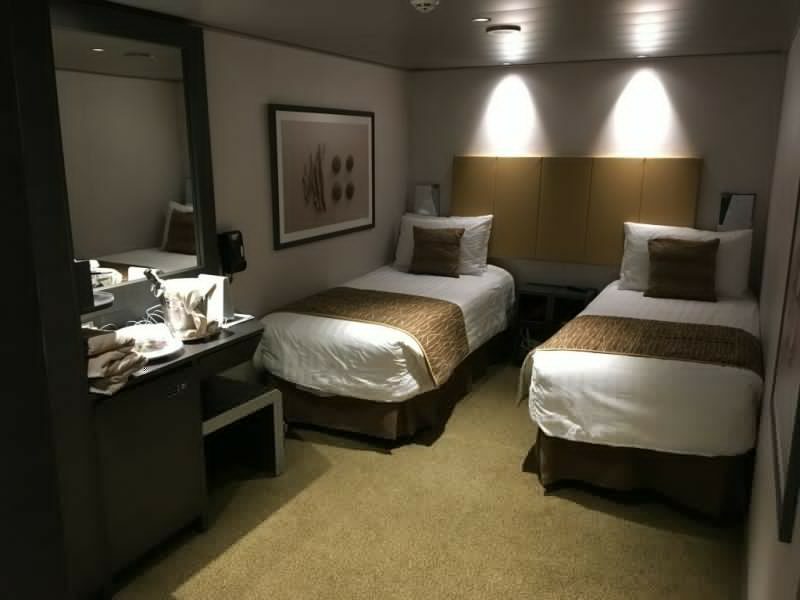 I have had lot of people tell me that MSC are not as good as the likes of Royal Caribbean but I honestly had no complaints and in some areas I found I liked it better. This looks amazing! I now need to go on a cruise asap! I have learned so much about cruises from you. I truly had no idea how huge and extravagant they can be! Loving the look of the pools.